One key element in the process of designing a house is the ability to visualize the structure before it is built. For me, that isn't too big of an issue but for people who lack the ability to instantly 'convert' a flat, 2D floorplan into an active 3D walk-through--i.e., Jen--it becomes a lot more of a struggle. One option is to find an architect that does 3D modeling as part of the design but that isn't always available or it might be cost-prohibative. Enter 3D tools like Chief Architect's Home Designer. It's the consumer version of their 'Premiere' line which is a tool aimed at the actual architects, but Home Designer has a lot of the features for 10% of the price. Plus, once you have the initial software, you can always upgrade until you have the features you want. 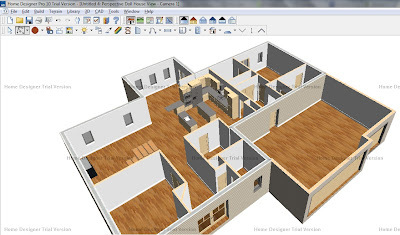 One of the cool things about Home Designer is the auto-generation of 3D motion based on your floor plan. It will take a couple of hours to (re-)create your plan(s) but once created, it looks very nice. Below is a little screenshot of the trial-version and 90 minutes of work based on our floorplan. I would have played with it longer but it's the wee hours of the morning and we have an 8:30 am showing tomorrow (fingers crossed and prayers said!). I think we'll be buying this little gem so I can show my wife whatthe latest changes will actually look like and what the impact will be on the rest of house. The before-mentioned ability to create a 3D walk-through will make that so much easier for Jen. With 1000s of library objects (furniture, windows, doors, etc. ), ability to import pictures for texture and colors and a dazzling area of other designer options, I'm a fan and will gladly pay for this over a free tool like Google Sketch-up. Just take 15 mins and look at this video to see how intuitive and impressive this software is for home owners.